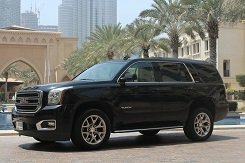 Full-size frame SUV GMC Yukon with a comfortable cabin and plenty of useful electronics inside. Ideal for long trips with the whole family. On board this handsome mounted 5.3 liter V-8 engine with a total power of more than 350 hp. Full drive and a classic 6-speed automatic will allow you to move comfortably both in the city and off-road.